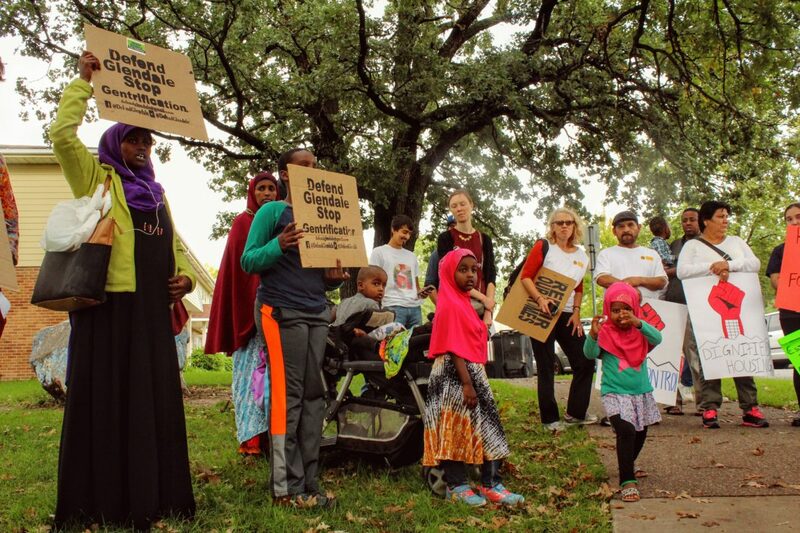 Residents and housing organizers from across the Twin Cities gathered at Glendale Townhomes on Sept. 22 as part of a day-long tour from Minneapolis to St. Paul during the Renters' Day of Action. Photo by Cristeta Boarini. Minneapolis is in a housing crisis. As condos go up, driving up rents, thousands in the city are homeless. Minneapolis Public Housing Authority (MPHA) is selling off housing that thousands rely on. New public-private partnerships to provide housing inevitably transfer funding and tax dollars for housing from the state to the pockets of landlords and private corporations. All the while, the city is becoming further gentrified, pushing people of color and the working poor out to white suburbs where they have no access to transportation or jobs, and feel unsafe amid the post-election racism. For two years now, residents of the Glendale Townhomes have been fighting to protect their community from destruction. They are fighting the unscrupulous interests of developers and politicians to fill their pockets, and the rhetoric that threatens public housing. Take for example the latest report from developer consultant Sherman Associates presented to the meeting of the MPHA on June 22, 2016. For each of the four possible development options for the Glendale site, Sherman Associates outlined key benefits and drawbacks. The Defend Glendale Campaign analyzed the report and discovered a bias towards redevelopment, which transforms a public good for the many into private profit for a few. Significantly, when comparing the number of key benefits and drawbacks for each option, the report directs readers towards perceiving Option 4, or full development and completely new construction, as the only feasible option. The arbitrary number of benefits and drawbacks in the table shows who each option values – the Glendale community or redevelopers. For example, the Sherman Associates report suggests that full development of Glendale will result in “more light rail access.” The assertion assumes and concludes that current Glendale families are not utilizing their local public transit system, despite the fact that residents rely on public transit to reach health care providers, schools, and their jobs. There is already direct access to the Green Line Light Rail from Glendale. Full redevelopment would changes who gets to access to the Light Rail: Low-income people who need it to get to their jobs, or gentrifiers who have cars and use it sporadically to attend football games. The report does not investigate resident retention strategies, or how the residents will be able to stay in their homes. This is because tenant retention is never the goal. Research shows that the transformation of public housing into public-private partnership is done to remove an essential safety net from those that need it the most. Gentrification displaces low-income families from Minneapolis and its amenities. None of the $113 million Sherman Associates is asking for to demolish Glendale comes from private investors, it is all tax dollars and government funds. Yet MPHA says they have no money to make basic rehab while they get funds from the state annually to make repairs and rehabilitate properties in need. Every year they skip Glendale and rehab others. The report provides no timeline for its lauded full redevelopment option, nor a schedule for upkeep during the additional work needed to explore the Sherman Associate scenarios. This lack of interest in devising a timeline shows that MPHA is engaging in a process of “redevelopment by neglect” – refusing to upkeep while considering redevelopment plans with the hope that the homes will fall apart thereby enabling redevelopment. Although MPHA tabled this report, they refuse to provide funding for repairs placing Glendale under continuous threat. For example, the Defend Glendale Campaign recently learned that the Sustainable Resources Center, Inc. (SRC) – a non-profit organization whose mission is to insulate homes, provide clean air, energy efficiency and energy savings programs to homes in Hennepin County – offered MPHA the opportunity to insulate all of 184 units of Glendale free of charge in February 2016. SRC receives funding from U.S. Department of Energy. SRC’s goal was to start the insulation process last year. DGC learned that MPHA has been purposely blocking SRC from insulating our homes for almost 12 months because MPHA wants to demolish Glendale in the coming years. MPHA does not want any repairs or insulation to take place in Glendale at all. MPHA has made this decision even though funds are available to insulate, fix and repair Glendale. In December 2016, the city of Minneapolis voted to hire Gregory P. Russ to lead MPHA without community input or engagement. Russ is known for his national record of privatizing and selling off public housing to private corporations. This confirms MPHA still wants to privatize Glendale, other MPHA properties and gentrify Minneapolis as they oversee 20,0000 residents who are low-income, majority people of color, seniors and the disabled. Minneapolis counts housing affordability based on a percentage of the overall median income. Considering the vast wealth gap, reproduced through race and ethnicity, affordability based on median income does not speak to low-income Minneapolis residents. There is a huge different between income based housing for low income residents that are public housing, and the term politicians use now that is “affordable housing.” “Affordable housing” is not for the poor, nor is it for the working class. It is for the middle class. Therefore, the development of further public housing – where one pays a third of their income, no matter what that income is – the only way to increase actual housing affordability in Minneapolis. The recent Center for Urban and Regional Affairs report on gentrification shows that Minneapolis is a tale of two cities: in one city, middle class whites live in a paradise of accessibility to jobs, entertainment, and quality of life; in the other city, working class folk and people of color struggle in substandard or unaffordable housing, are pushed out of the city altogether, or are made homeless. We need a city and a city government that implements strict rent control measures, increases its public housing arsenal, and repairs and protects the public housing it currently has in stock. For an equitable Minneapolis, we must recognize housing as a human right and public housing as a public good. The newer housing is unaffordable for many white middle class people as well. Rents go from between $1000 to $1500 a month for a new one bedroom. That means a person has to make $3000 to $4500 a month and $36000 to $54000 a year. That’s not affordable for many young people, government workers, and teachers. Minneapolis doesn’t want to make itself a white middle class utopia. It wants to a be a rich utopia. The proposals for development give away to private interests 14 acres of clean public land next to a park with184 units of public owned housing that is 50 years newer than the rest of the neighborhood. That is maybe $40 million+ given away to private developers and banks with no return because there will be public funds and tax increment financing for at least 20 years on the land and buildings to be owned by the privatizing developers and banks while they collect rent and can sell the land and buildings for profit. The current residents will be given “vouchers” that landlords will not have to honor but maybe they end up in some outer suburb with no transit, schools, services or jobs close by. Or maybe they just end up under the Franklin bridge. We’re glad to offer a brief response to this piece, which also appeared in other local publications. Given MPHA’s mission to provide housing for many of the very poorest city residents, we could not agree more with the writers’ concerns about gentrification and access to truly affordable housing. Unfortunately, the writers’ points about Glendale rest upon a collection of incorrect facts, and upon assigning nefarious intentions to us that we simply do not have. MPHA has been clear in our public materials and to anyone who asks that we have approved no plan of any kind to “demolish” or redevelop Glendale. The “Sherman Report” that draws so much ire from the writers is nothing more than an analysis of four hypothetical options, among a universe of many more we might explore, spanning a range that included both rehabilitation and comprehensive redevelopment. Every option included two top priorities for us: preserving all 184 family units at current rent levels, and continued ownership by MPHA. The assertions that our goal is to “gentrify,” “privatize,” “destroy,” or otherwise reduce the precious family housing at Glendale are entirely untrue. The involvement of Sherman Associates began and ended with this study, delivered in June of last year. Sherman Associates did not propose and has not sought any further involvement in Glendale beyond the independent, third-party analysis of options we asked them to provide. If and when we move forward with the city and community with a plan to preserve the homes at Glendale, they would be free to submit bids like any other entity. While there is no design or funding mechanism that have been proposed, much less approved, MPHA makes no secret of the need to face the long-term, structural needs at Glendale. We continue to maintain the comfort and quality of life at Glendale at the high standard we set for all our facilities, albeit at a perilously increasing cost. The townhomes are our oldest major property, and after 65 years the time has come for a constructive conversation about how to preserve these family homes for the next 65 years and beyond. MPHA is charged with ensuring that Glendale is a resource for families today and for future generations. While we hold this responsibility, we recognize that we can move forward only by working with partners who share an interest in ensuring that Glendale preserves and retains homes for very low-income families. We welcome all groups—and most especially public housing residents—to join this partnership.